Last night’s Phillies win closed the book on Cliff Lee’s amazing playoff performance, unless he comes back on Thursday out of the pen on two days rest. A couple weeks ago, Marc looked at the prospects the Phillies gave up to get Lee, but after Lee’s dominating playoff performance these guys are afterthoughts for Phillies fans. Lee has pitched in five games over three series and the Phillies have won each of those five games. He pitched at least 7 innings in each game (and completed two of them). Overall, it works out to 40 innings of 1.56 ERA, 5 K/BB, 0 HR postseason baseball. Dave C. noted after Lee’s first game against the Yankees that the Fox broadcast team was drooling over his curve, but his changeup was more impressive. Here I give a visual representation of this fact. I plotted the location of these two pitches over the course of the playoffs. 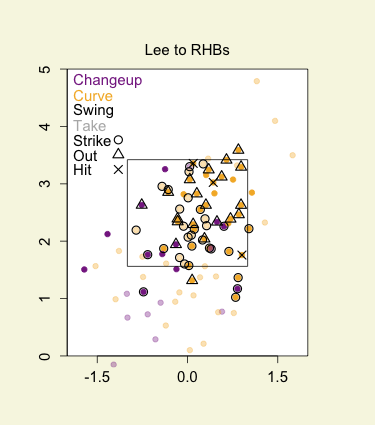 As I often do, the full color dots represent pitches swung at and faded ones those taken. I encircle strikes (taken strikes are encircled faded dots, whiffs encircled full color), put triangles around balls in play that were outs, and Xs on top of hits. Solid color pitches with nothing around them were fouled off. 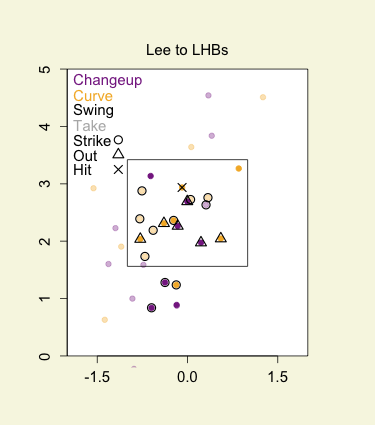 You can see that Lee is actually fairly comfortable mixing in his changeups to LHBs and got a nice number of called strikes on the outside edge of the plate. Overall, lefties only got one hit against his change and curve over the course of the playoffs. Against RHBs his change is a huge part of his repertoire and he pounds it away and mostly up. Batters swung at it a lot, but didn’t have much luck mostly making outs or fouling it off. He got a fair number of called strikes on his change right down the middle of the plate. The Phillies got just what they wanted in Lee with a mid-season trade. In the regular season he helped them keep their place comfortably atop the NL East, and now in the playoffs he has pitched in five of their wins (including their only two World Series wins), giving them 40 impressive, and bullpen-preserving, innings. We hoped you liked reading Cliff Lee’s Playoff Dominance by Dave Allen! And we have him one more year! And the means to keep him around after that!